Build your own beautiful garden walls using local rocks. Easy to install – no special tools required, just a few flat packed Soho Gabion BasketsTM, a pair of gloves and light-weight wire cutter or pliiers. Just build your baskets and fill with your chosen rocks. 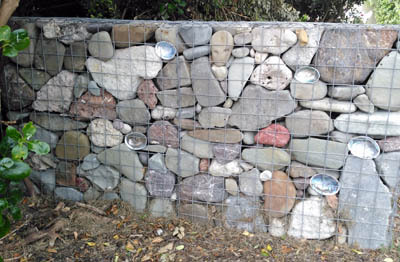 If you take the time to hand-place stones with flat faces against the mesh and can create a natural interlocked pattern, your wall will reflect the traditional dry stone wall technique. Being lightweight mesh, the hot dip galvanised steel baskets are barely visible from a distance completing the illusion of a wall crafted by an expert stonemason! pollution free: If there is a need to retreat from an environmentally hazardous area a gabion wall can be disassembled and the rocks left as a natural cairn or removed, with the gabion baskets, for rebuilding elsewhere. No residue, pollutants or concrete foundations left to spoil the site. Soho Gabion baskets are manufactured from 2.5mm steel mesh welded in 75mm rectangular grid and protected with hot dip galvanising to Galfan 255 gm/m2 specification. Helical connectors and internal ties are hot dip galvanised. 9 no 500mm internal cross ties. You can trim your Soho Gabion basket panels and connectors to smaller sizes with lightweight wire cutters. Non-standard sets based on half size baskets of 1000 x 500 x 500 can be ordered for half-height or one-and-a-half-height walls. Free standing walls above 1500mm in height may require cantilever timber posts at 1000mm centres concealed in their interior for added stability.